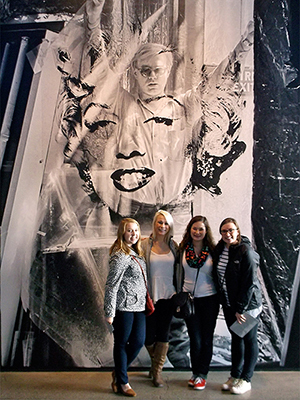 Society of American Studies Scholars pose in front of an exhibit at the Andy Warhol Museum in Pittsburgh, PA.
Students must select and take 18 semester hours with at least 12 hours at the 200 level and above, incorporating at least 3 different disciplines, from one of the following areas of concentration. This area of concentration focuses on the core institutions, ideas, and expressions that define America as a nation and an ideal. It provides a traditional American Studies track. This area of concentration focuses on the diversity of cultures that come together in the United States, addressing issues of race, gender, class, religion, ethnicity, sexual identity, and other social categories. It provides the equivalent of an ethnic studies track. This area of concentration focuses on global perceptions and analysis of American culture and values, and on the position of the United States in the global world. This area requires study abroad for a semester at one of our partner institutions and is developed in consultation with an advisor. This area of concentration focuses on consumer culture, popular culture, and mass media. It addresses issues of representation, visual culture, and the marketplace. This area of concentration focuses on the practices and activities of civic engagement, the construction of shared identity and public memory, and the interpretation, presentation, and preservation of cultural resources.